The Water Services Sector Group’s Social Media Conference was recently held in Sydney and I had the pleasure of attending. With a focus on crisis management and disaster response, a number of key speakers from various parts of the world shared their insights and experiences in the growing field of social media, which all agreed is now an undeniably important component of modern society. Melanie Irons spoke of the pivotal role of social media in mobilising a community through her Facebook page in response to the 2013 Tasmania bushfires. Suzanne Bernier used examples such as the ‘Yes we can’ Obama campaign and ‘Domino’s Pizza Scandal’ YouTube videos to illustrate the role of social media in shaping the reputation of individuals and organizations, demonstrating the impact social media use can have to define, destroy, or strengthen during crisis scenarios. Caroline Milligan described the concept of a ‘Virtual Operations Support Team’ with key events such as the London 2012 Olympics or Hurricane Sandy having much of their social media crisis preparation and response performed virtually by her team based in New Zealand. And Charlie Hawkins demonstrated some of the latest social media harnessing and visualization tools developed by the CSIRO. While shortcomings were noted, such as the need for report verification, rumour control and negative posts, the overall consensus was the positive attributes of social media use in crisis management, such as the facilitation of coordination and collaboration, speed of information transfer, bi-directional communication and individual empowerment, far outweighed the negative. The message of the day was clear: social media is here to stay. It needs to be incorporated into emergency management strategies and policy in order to foster the most effective collaboration between connected communities and official information sources. The general public now expect authorities and organizations to be active on social media. How organizations respond to this expectation and how they conduct themselves by involving (or not involving) themselves in social media conversations can directly impact their perceived credibility and overall effectiveness both in disaster situations, and in public more broadly. Today’s post is just a little shameless plug for something else I’ve been doing. I’ve probably posted in this blog less than I imagined I would when I started it, partly because I sometimes write for another blog, called Trending City. Trending city is a platform for sharing ideas and trends in the world’s cities, predominantly surrounding architecture, design and culture. I’ve posted links on this site to my contributions to Trending City previously, so check those out if you’re interested. 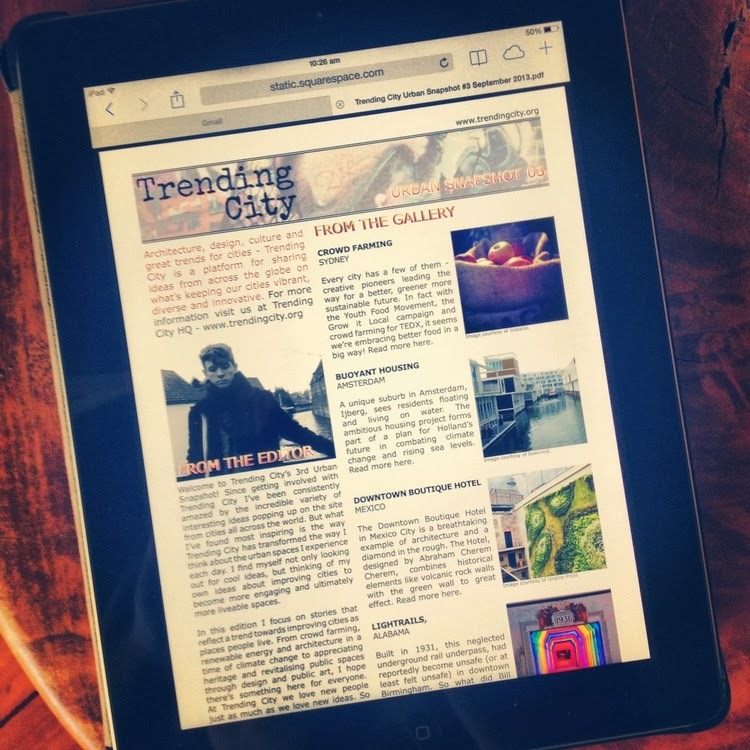 But today’s shameless plug is for the latest Trending City Urban Snapshot (a quarterly newsletter highlighting some of the great stuff recently on the site), of which I was guest editor and curator! Hoorah! Check it out here.